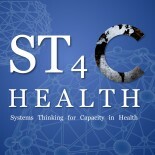 Connect with others, and collaborate around research, obtaining funding, and shared learning related to systems thinking and health. May you kindly put my name on the mailing list. Thanks for stopping by. I’ve included you on the email list. please add me to the email list!!! Please sign me up for the mailing list. Would like to be included on the mailing list. Please sign me up for this or put my name in the mailing list. Chad, We appreciate your leadership on this effort and your participation at our Fall Meeting. As you know, CORE Group seeks to advance community health programming. Thus we feel it is critical that “health systems strengthening” doesn’t only focus on facility-based services, but includes “community health systems” i.e. what happens in households and around each community. After all that’s where most “health care” happens–ranging from breastfeeding to home-based care of sick children. Thanks for giving us the space to represent this perspective in your comprehensive, inclusive effort. We received 360 abstracts from 50 countries. The review is underway, but I have noticed that some of the papers submitted address the impact of GHIs on health and health systems. We also recently set up an online community (6000 people in our database) where several discussions are regularly organized (http://www.globalaccesstohealth.net). Feel free to contact me, should you be interested to launch a discussion on GHSIA. I like to involve in this, kindly add me in your mailing list and update me the things. Please add me to your email list, I would love to get involved in such a worthy and important cause. I want to belong to a group that gets involved in worthy causes. I live in Tacoma, WA. There are lots of problems around here that I don’t know about, but need help. Pls include my name too in the mailing list..I am interested in knowing about health systems stengthening activities..
Kindly add me to the mailing list. Kindly include my email in the mailing list and I would be interested in courses, fellowships and graduate programs with focus on health systems strengthening with particular focus on NCDS and Human Resources for Health and Policy Analysis. I am independent health consultant based in Abuja Nigeria. Kindly add femiakande81@gmail.com to the mailing list. Thanks. Please, add me to your mailing list and let me know of any conferences. I am a lifelong teacher of systems thinking (Gregory Bateson) and relationship and context centered family therapy. Please include my details on your mailing list. Please add me to your mailing list. I’ll love to help in any way we can think. I am Dr. Nitin Jadhav working as a Health activist in one Civil Society Organization in Maharashtra state of India. Kindly add me in your mailing address.